About the time that Augustus was ruler of Rome, not long before Nero spoiled it all, Teotihuacán was a powerful center of culture and would shape the political history of ancient Mexico for the next 800 years. 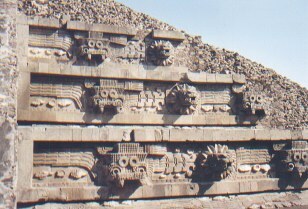 The people of Teotihuacán, about 250,000 strong, built monumental temples, streets, marketplaces and palaces, and decorated them with splendid relief, murals and ground paintings. Why was the city built, and by whom? There are, of course, conflicting theories. But the academic world agrees that whoever engineered this grand example of ancient civilization, the city was built in grand style for spiritual and political purpose. Ancient myth says Teotihuacán was the birthplace of creation, and where the Gods would sit to observe the evolving world and judge its progress. Indeed, the influence of these ancient people and their amazing civilization was far reaching. Teotihuacán may well have traded and maintained a spiritual influence over ancient rival cities as far away as Ecuador and Peru, and may have been related in one way or another with North America’s Canyon de Chelly and Mesa Verde of the Anasazi. Teotihuacán is located less than an hour north of Mexico City and is a marvel for even the casual explorer. The most influential center of ancient civilization in the Americas, the city, now a national park, is massive in size and scope covering over 30 square miles. At its center are the pyramids of the Sun and Moon. 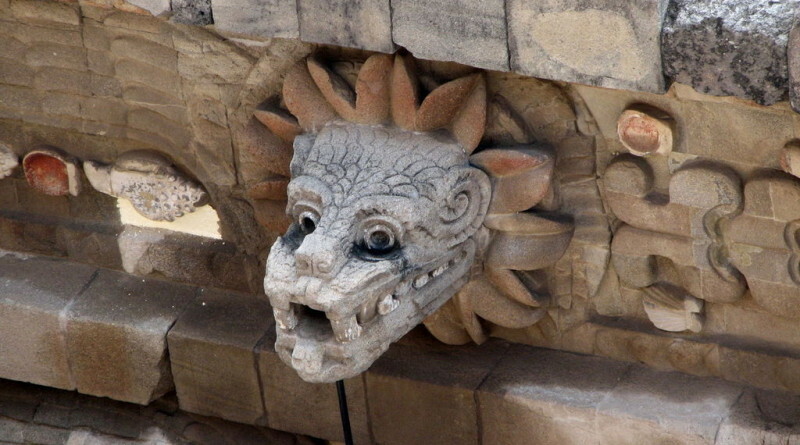 The Templo de Quetzalcoatl is an ornamental monument of great religious significance and provides a glimpse into the refinement and artistic spirit of this ancient cultural center. 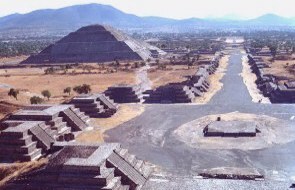 The ceremonial centerof the great city is laid out in symbolic representation of two axes; the north-south axis is named the Avenue of the Dead from which, akin to the wings of a butterfly, buildings, palaces, plazas and altars extend to either side. At one end stands thePyramid of the Moon and off to one side, rising in an immense stone mass, looms the Pyramid of the Sun; two massive structures representing the duality of creation between nature and the men who built these walls with volcanic rock and limestone. Hundreds of years after it was abandoned, other men named this site the “City of the Gods”, and not without reason, for its existence was governed by deep religious convictions and ways of life centered around the natural cycles and seasons of sowing, reaping, rainfall, and a cosmology of strict phenomenological relationships whose astronomical and calendrical expression was reflected in the construction of the city. Beginning around 700 AD, people simply stopped living in the city. Why they left is anyone’s guess. But archaeologists have found evidence that a great fire decimated just about every structure in the city in 700 AD and some argue that the fire was caused by an invading people. Whatever the cause, the city never really recovered from the disaster, although it was reoccupied by the Aztecs in the 14th century. In addition to the superior building skills of the founding people of the city, art and science had become a motivating factor in the design and evolution of the city. Fine ceramic creations and painted frescoes originating from Teotihuacán are considered rare specimens of ancient art throughout the world. 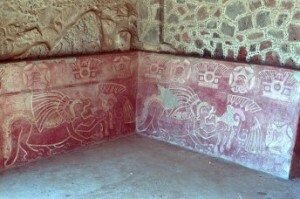 To create the frescoes, workmen in Teotihuacán layered coats of ground lime or stucco over the palace’s rough walls. The artist then mixed and applied pigments to the wall while it was still wet. The colors used were earth tones, such as hematite red and ochre, as well as greens, blues, and whites. Once the composition was painted or drawn and the painting almost dry, artists would burnish the entire surface with a stone until smooth. It must have been a stark and impressive site to crest a mountain peak in Central Mexico in the first century and look down upon a city that looked as much like a theme park as a center of commerce and trade. A trip to the city is always an adventure in spite of the constant barrage of tour buses throughout the afternoon. About 50 KM north of Mexico City, you can opt to take a tour bus and join the throng of travelers who flock there every day, or you can rent a car and drive there earlier in the morning or later in the afternoon to have more room to run through the huge site.